In 2014 NHS England published The Five Year Forward View. Through it NHSE outlined objectives for the NHS that were then, and have proved to be now, totally unachievable. The clear motivation was a cover story for how the NHS was to survive an government-imposed unprecedented funding crisis – £22bn of underfunding from the Government for the NHS from 2015/16 to 2019/20. Evidence-based need was for £30bn increase in annual funding over those five years – the Chancellor and Prime Minister refused to agree more than £8bn – and that was conditional on demands being met for major NHS disruptive reconfiguration. The strategy to implement the Five Year Forward View was through Sustainability and Transformation Plans. The vehicles for these plans morphed into Accountable Care Systems and Accountable Care Organisations – language that comes from the USA. Toxified by campaigners, they are now in their fourth iteration repackaged as Integrated Care Systems to be delivered by Integrated Care Providers, appointed through tendering and open to private organisations – contracts worth billions per year each one to run an individual fragment of a dispersed NHS for extended periods of 10-15 years, covering the health and care needs of up to a population of 500,000. This final phase is the spectre facing the NHS, currently out to consultation till 26 October 2018. See much more information and analysis at Health Campaigns Together and our video on ICPs and our post on the NHSE consultation. Through the following section we’ll give an overview of each of the stages of these systems over the last 8 years. You can click below to skip to a particular section of interest. STPs are 5-year plans that divide up England into 44 ‘footprint’ areas and call for a massive change to the NHS in each area. Despite claims that they are there to ensure regional health services better cater to local populations’ needs, they are in fact a way of cutting services to meet ever-dwindling budgets and allow easier privatisation of what is left. The plans were developed in secret, with no public consultation. They include widespread cuts to acute services (hospitals), with people having to travel further and further to get the treatment they need. This is hidden by using obtuse, ‘managementese’ language (eg, ‘the wellness paradigm’). They mention ‘community care’ as alternatives when in fact the community does not have the capacity, funding or in some cases expertise to pick up the demand. Further cuts are being planned which go beyond the STPs in some areas even before they have been implemented, because the under-funding is so serious. STPs will also make it even easier to ‘contract out’ services to private suppliers, further undermining the NHS in that area. You can find the details of the STP for your area on the Health Campaigns Together web site. Stevens named these ‘Accountable Care Systems’ (ACS). He predicted that these would evolve in a variable number of years but in all areas, into hardwired structures he had unashamedly given the USA-derived title of ‘Accountable Care Organisations’ (ACOs). The ‘ownership’ of ACOs would be via a 10-15 year contract tendered out to an interested party or parties, explicitly including the private health and financial industry. Model contracts put forward the possibility of a Special Purpose Vehicle. SPVs are notorious in the case of financial wheeler-dealering of private finance initiative contracts (PFIs). See our review of ACSs and ACOs and the very helpful full briefing. In new NHSE guidance issued 2 February 2018, Stevens renamed ACSs as Integrated Care Systems (ICS) and accountable care organisations as Integrated Care Providers (ICPs)- explicitly to avoid the link with the US cost-capping, insurance-based accountable care organisations. All available in our Resource Cabinet under ‘Accountable (Integrated) Care Organisations and Systems’. As little as six years since the massive restructuring imposed by the Health and Social Care Act 2012 (HSC Act), the National Health Service is again undergoing radical change, this time at breakneck speed and without parliamentary consent. Far from replacing competition with collaboration, NHSE intends to replace multiple smaller NHS contracts with a single long-term lead Integrated Care Provider contract (ICP and previously known as ACO) contract for each area of England of up to 500,000 population. These ICPs would continue to issue multiple smaller subcontracts! Accountable Care Organisations (ACOs have been re-packaged as Integrated Care Providers (ICP) – the contract for which is subject to NHSE’s consultation (August to 26 October 2018). They will apply unprecedented cuts in spending(£22 billion by 2020, compared with 2015 levels) and transfer the NHS’s funding shortfall to new local, self-contained areas. Simon Stevens has made clear his intention that ACSs will develop into ACOs and NHS England’s model contracts assume a tendering process inclusive of bids from private companies or special purpose vehicles to run whole systems of the erstwhile NHS. Here and now, the development and management of accountable care systems themselves are being offered to private companies – as in Greater Nottingham. 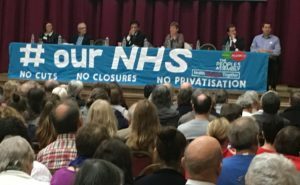 New legislation that protects Bevan’s founding principles of the NHS; ends the marketisation and fragmentation of the NHS; and re-establishes public bodies and NHS services that are accountable to Parliament and local communities – legislation such as that drafted in the NHS Bill 2016-17. There have not been actual cuts in total NHS funding since 2010 – funding has risen very slightly in cash terms. However, the rise has been far slower than the growth of population need and cost pressures. £22bn is the gap between the virtually frozen funding 2015-2020 and the steadily rising costs and pressures, and that implies “savings” which must amount to cuts.